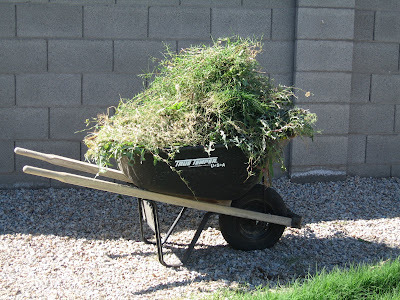 I spent my morning in a bloody one woman attack on the weeds in my back yard. I gained a lot of ground but the tough soldiers in the back quarter who survive on minimal rations were too tough for me. I considered it a stalemate when time after time my pulling efforts resulted in a hand full of leaves and a root in the ground waiting for it’s chance to insight a rebellion. My plan is to allow a supply convoy to be intercepted, get them good and watered and when they are all gushy and let their guard down I’ll swoop in and yank them out of the ground so fast they’ll be in the garbage can before they realize defeat. Also, tomorrow I’ll have reinforcements in the form of Mr. Uniquety who plays dirty. That’s right, he’ll likely be bringing chemical weapons into play.